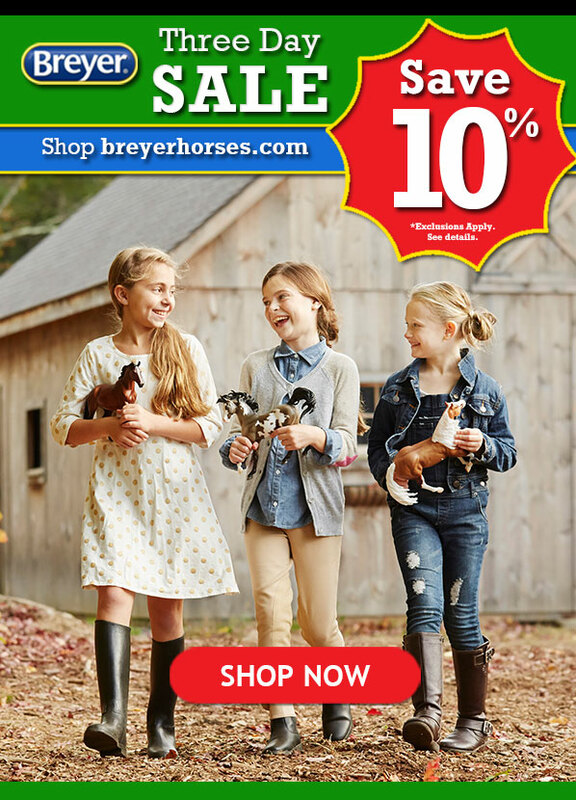 Subject: ENDS TONIGHT: Last Chance to save on Breyer gifts! Just Three Days to Save on Breyer Horses! Three Days to Save on Breyer Model Horses! Save 10% on all your Breyer Holiday Gifts! Use promotion code NEWBREYERGIFT at checkout! Discount applies to select regular price items only. Exclusions Apply. December 5 2014. See below for complete details. *Offer Terms & Conditions: Enter the discount code provided above in ALL CAPS at checkout to receive 10% off your purchase from 12:01am EDT on Wednesday 12/3/14 until 11:59pm EST on Friday 12/5/14 at www.breyerhorses.com only. No minimum purchase requirement. Discount applies to product cost only. Purchase must be completed by 11:59pm EST 12/5/14. No rainchecks and no substitutions. Cannot be applied to prior purchases. Cannot be combined with any other offers. Offer is limited to in-stock inventory and may no longer be available when you visit the website. Offer does not apply to select merchandise including without limitation special/limited run items Web specials bundles event tickets/models BreyerFest tickets and merchandise memberships gift certificates special programs club models or continuity programs and sale and/or clearance items. Prices and availability of products are subject to change without notice. Errors will be corrected where and when discovered. Reeves International Inc. reserves the right to revoke any stated offer cancel orders and to correct any errors inaccuracies or omissions in any stated offer or price including after an order has been submitted and whether or not the order has been confirmed and your payment processed. Void where prohibited or otherwise restricted by law. Copyright 2014 Reeves International All rights reserved.